"Freedom. Country. Honor. Passion. To save his best friend, one man must risk everything he loves." Released in 2002, The Four Feathers is an American action drama movie that transpires in 1884 and revolves around the British military troop's Gordon Relief Expedition in Sudan, Africa. It depicts the tale of a young lad who is accused of being a coward. The movie stars the late Heath Ledger, Kate Hudson, Dijimon Hounsou, and Wes Bentley. The Four Feathers runs approximately 131 minutes and was produced with a budget of $80 million. It was unable to recoup its production budget and was only able to gross nearly $30 million at the Box Office. 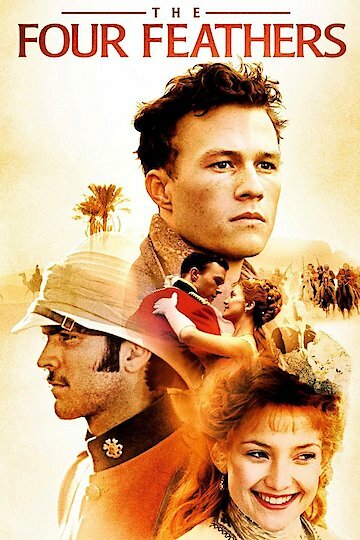 The plot begins with Harry Faversham, a young British commander played by Heath Ledger, as he commemorates his engagement to Ethne, played by Kate Hudson. During the extravagant ball thrown for the event, the couple is joined by Harry's comrades and his father. Soon after, their commanding colonel, played by James Cosmo, declares a mission to rescue the British General named Charles Gordon who is currently in the hands of Muslim rebels. Harry and his comrades are dispatched to Sudan, Africa where the lands are ruled by Egyptians. But before they can leave, Harry becomes anxious and relinquishes his position. Stunned and offended by his son's decision, Harry's father renounces him as his son. Presuming his decisions were led by cowardice, Harry's comrades and former wife-to-be gives him 4 white feathers, which is a mark of cowardice. Suffering a great ordeal and all alone in his quarters in London, Harry learns that his close friend Jack, played by Wes Bentley, and his past unit have come under horrific bombardments by Muslim rebels. Taking the dangerous road into Sudan all by himself, Harry meets Abou Fatma, a smart and strategic mercenary warrior, and makes an alliance with him. To safely trek through the Muslim inhabited territories, Harry pretends to be an Arab. He and Abou Fatma follow the trail of a unit of military laborers that they believe to be Mahdi spies. The Four Feathers is currently available to watch and stream, buy on demand at Amazon, Vudu, Google Play, iTunes, YouTube VOD online.